A work examining what’s good for American business and what’s good for Americans—and why those interests are misaligned. Hacker and Pierson follow the trajectory of the Republican Party since its radicalization began during the Reagan administration, and conclude that the GOP's fealty to wealthy and powerful rent-seekers has been pretty successful ... Hacker and Pierson do a good job of telling both the history of the mixed economy as well as its more recent breakdown. If you're already familiar with this story, there might not be much new here for you. For the rest of us, it's as good an introduction as you're likely to find. You don’t need to Feel the Bern to take this book seriously. The unexpected popularity of both the senator from Vermont and Donald Trump in this year’s primaries arguably reflects their tapping into widespread anger toward the American establishment. American Amnesia provides chapter and verse on why the public has good reason to be angry. In trying to explain this 'breathtaking' transformation of business norms and political opinion, Hacker and Pierson fall into the common trap of trying to construct a simple narrative of cause and effect, good guys and bad guys ... While much of American Amnesia turns out to be an unsatisfying rehash of recent history, its basic political insight is sound: The only way for Democrats to regain the political momentum is to purge from the American imagination the myth that the government that governs best is the government that governs least. 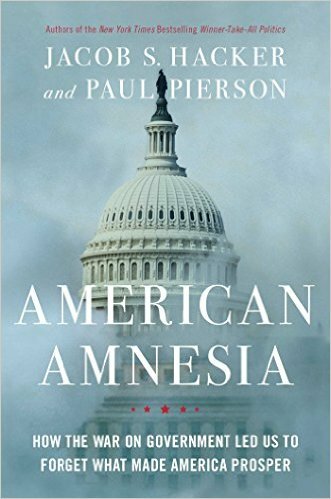 What did you think of American Amnesia: How the War on Government Led Us to Forget What Made America Prosper?